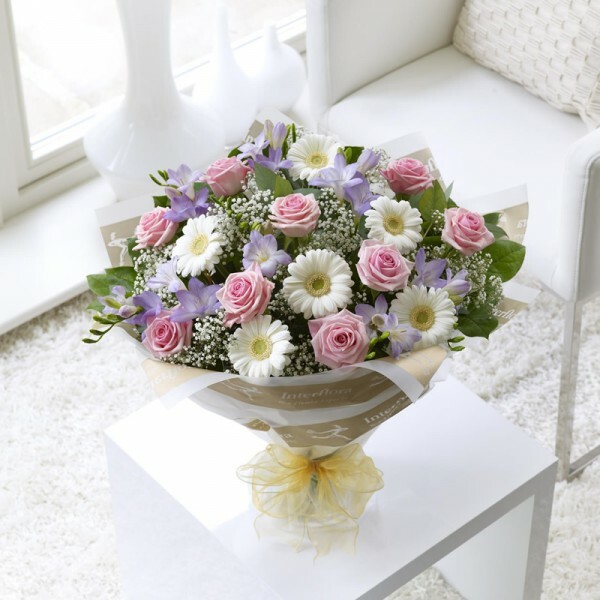 Soft shades of cream, pink and lavender combine beautifully in this stunning hand-tied of mixed roses and freesias. It's such a pretty colour combination and just perfect to celebrate the arrival of a new baby girl. Not only does it look picture-perfect, the sweetly scented freesias mean it smells divine too. Featuring pink large-headed roses, lilac freesias, white germini and white gypsophila, hand-tied with eucalyptus and finished with new baby gift wrapping and pink ribbon.